Saturday 24th & Sunday 25th August were the dates of our first open weekend. We had a temporary licence for the weekend so put in a pop-up bar in our brewery area, borrowed some seats & tables and got in some of our own Mayflower Gold on draught and a few other local ales too. The aim was to get people to come in for a drink and find out a bit more about our brewery project. The microbrewery had just been ordered and we put up a few pictures of what our brewery would look like and where the different vessels would be sited. However at 11am on Saturday morning the heavens opened. At 11:30 I looked outside and said, “Well it can’t keep on raining like this”, and went on to say the same thing for the next 3 hours! Billericay was flooded, Waitrose had to close, houses were evacuated, roofs fell in – what a day to choose! However at 2:30pm the rain had eased off and lots of courageous people braved the floods to get out for a beer – thanks to all of you. By 3pm all our seats were occupied. 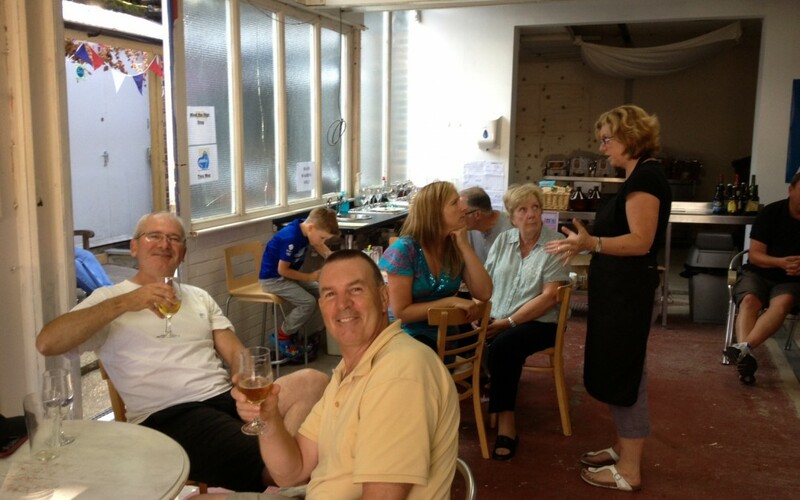 Everyone really seemed to enjoy having a beer in our brewery area. Only thing was our licence finished at 5pm and most people having made a late start were ready to continue drinking. The open day continued on Sunday and the weather was much better. This meant we could actually use our courtyard and on a bank holiday weekend we had full seats both inside and outside. So with this great feedback we will make this a regular occurance – aiming to do once per month. Next open weekend will be Saturday 28th (11am-7pm) & Sunday 29th September (12-5pm). Also this time we will start on Friday evening (5 – 7:30pm) with a visit by Logan, the brewer at Beavertown, for a talk and tasting about their fantastic beers – pop up bar too! They braved the floods on Saturday!